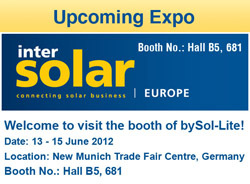 bySol-Lite is going to attend the Intersolar Europe 2012 in Munich, Germany. Solar Powered Electric Tricycle, which is solarized by Long Life Thin Sol-Cryst-FLATTM Panels from bySol-Lite. bySol-Lite launched Foldable and Powerful Sol-ChargerTM for Laptops, Tablets with Canvas Bag. Corporate Cultural Events have been held at our factory, including Basketball, Ping Pong, Tug of War, and Karaoke. 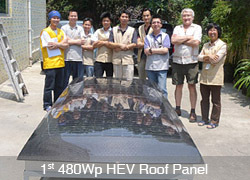 Thin Sol-Cryst-FLEXTM Panels were Successfully Developed and Integrated onto Electrical Vehicle (EV & HEV) Roofs. 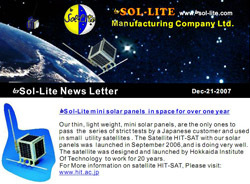 bySol-Lite Thin, Light Weight, Mini Solar Panels have been successfully on Japanese Space Satellite for Over One Year. bySol-Lite passed the TUV ISO 9001:2000 Certification. Newly Designed Full Long-Life Sol-PaverTM Light are Available now! bySol-Lite has moved to the new factory located alongside Fenghuang Mountain in Fuyong Town, Shenzhen. The environment means a lot to us at bySol-Lite, and we believe that we can contribute not only in the renewable energy industry, but also in the cause for environmental conservation. This is why we pledged our support to Green Power, a Hong Kong-based non-governmental organization (NGO) who are concerned about our city's environmental issues. The NGO was founded in 1988 by a group of dedicated volunteers and has made environmental education its foremost priority. Green Power established the first ever Green Schools Network in Hong Kong, to encourage environmental education in cooperation with schools. It works closely with teachers to promote and foster green awareness in young children. Three onsite Environmental Resource Centers have been established in secondary and primary schools. In our mission to support environmental education and awareness, bySol-Lite staff have regularly volunteered in their fundraising activities such as the annual Green Power Hike. More recently, we donated our new Anywhere Garden BoxTM towards the Green Campus Scheme for the Design and Construction of Roof Gardens at Local Schools. bySol-Lite publishes a quarterly newsletter containing information about solar projects, consumer sale items, updates on solar products and components, bySol-Lite corporate news, technical information and articles about bySol-Lite products and systems.